A new "major explosion" was recorded on the Stromboli volcano by the National Institute of Geophysics and Volcanology (Ingv). The intense explosive sequence follows that on April 24, 2018 involved the mouths of the central-southern area. In the night the first major explosion that affected the mouth "N2", in the northern area of ​​the crater terrace. The duration of this event was about 5 seconds. The coarse products, both lytic (fragments of already consolidated lava) and pyroclastic (shreds of incandescent magma), were distributed mainly in the west-northwest direction, covering the upper part of Sciara del Fuoco and rolling abundantly along its slopes. Seventeen seconds after the first explosion there were continuous jets of lava from the height of a few tens of meters that, gradually, followed by discontinuous explosions (spattering), interspersed with some explosions of ash and incandescent material of low intensity that reached a height maximum of about 80 meters. The entire explosive sequence lasted about three minutes. Subsequently, the volcano returned to its 'normal' Strombolian activity. These explosive events are marked by greater violence than the "ordinary" Strombolian activity which, on the other hand, characterizes this volcano in everyday life. These are unpredictable events that can cause the relapse of volcanic bombs, lapilli and rocky fragments that are also quite large in the summit portion of the volcano, and which are therefore potentially dangerous for any observer to pass through the areas of the Pizzo belvedere above the Fossa, or along the paths that lead you. The explosion occurred on the evening of April 26, due to the wind, produced an abundant relapse of incandescent material only within the terrace of the crater and along the Sciara del Fuoco, saving the area of ​​Pizzo. 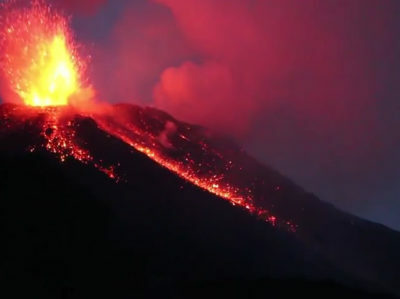 The eruptive activity of Stromboli is constantly monitored by the INVV through the observational, geophysical and geochemical systems managed by the Catania, Naples and Palermo Sections.